Maine is famous for its lighthouses, and Kennebunkport and Cape Porpoise are no exception. The Goat Island Light is a remarkable lighthouse on an island, viewable from the Cape Porpoise Pier. From the Kennebunks, you can tour more Maine lighthouse by driving the scenic coastline, starting with the most photographed lighthouse of all - Nubble Light in York. From this vantage point you can also see legendary Boone Island Light out at sea. In Portland, the first lighthouse commissioned by President George Washington is located in Fort William Park. 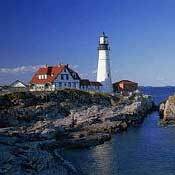 Portland Headlight is Maine’s oldest lighthouse, with a fantastic view of Casco Bay. While on your lighthouse tour, you must also visit Two Light State Park in Cape Elizabeth, there is a wonderful lobster shack here for seaside lunch too. Two lighthouses are perched atop the rocky shoreline. Off Rt. 77 in Cape Elizabeth. Directions: Take Route 1N to into Scarbourgh. Take a right onto Route 207 (traffic light at Oak Hill). Take Route 207 (Black Point Road). Follow almost to the end and take a left onto Route 77. Follow Route 77 to Two Lights road on right. 30 to 40 minutes. Maine's oldest lighthouse. Commissioned by George Washington in 1791. Adjacent to Fort Williams Park. Large grounds with picnic facilities and museum on the premises. 1000 Shore Rd. (off Rt. 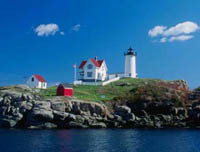 77) Cape Elizabeth. 799-2661. Directions – Option One: Follow directions to Cape Elizabeth Light continuing beyond Two Lights Road on route 77 to Shore Road/Portland Headlight. Option Two: Take I-95N to I-295N to Port/Waterfront Exit and stay to left. Take Danforth Street thru 3-4 traffic lights. Take right on State Street and cross over Casco Bay bridge onto Broadway Street. Take right at second traffic light (Cottage Road) to Shore Road. Headlight is on left. On a clear day, you can see six area lights. 40 minutes. York Harbor, ME. – Boon Island Light is six miles offshore and visible in clear weather from Harbor Beach. Erected in 1811 on a barren rock island, the 132 foot lighthouse operates today, as in the past, as a continual beacon to sailors. It can be seen up to 21 miles at sea. A story of a happening on this island is told in the novel Boon Island by Kenneth Roberts, 1956. Fact, and legend perhaps, has it that in December 1710, the Galley Nottingham wrecked on the island. Twelve of the crew of fourteen survived the wreck. After 20 days the ships carpenter died, his bones were stripped of their "beef" and the fat from the kidney was used to soothe frostbitten feet. After 24 days, a passing vessel discovered the shipwrecked survivors and brought them to shore.